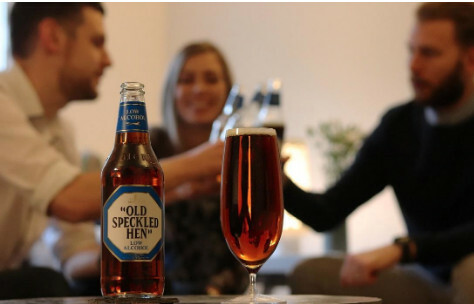 Old Speckled Hen, the UK’s number one premium ale, has launched the perfect alternative for those wanting to cut down on alcohol consumption and opt for healthier options without compromising on taste or refinement. The new Old Speckled Hen Low Alcohol version faithfully delivers flavour characteristics reminiscent of its 5.0% abv fellow flock member with echoes of the familiar malty toffee and caramel notes. However, at just 0.5% abv and 54% fewer calories, the new Hen provides a curiously refined alternative for anyone aiming to look on the healthier side of life. If Dry January has prompted the simple, more mindful pleasures, this fully flavoursome malt forward beer offers a refreshing, grown-up alternative to soft drinks and lack lustre alcohol-free beers that simply don’t hit the taste or occasion mark. Following on from the success of Old Speckled Hen Gluten Free, which swiftly became the number one selling gluten free premium ale after its 2017 launch, Old Speckled Hen Low Alcohol is ‘low alcohol’ rather than ‘no alcohol’ to help retain the distinctive flavours reminiscent of the original Old Speckled Hen. Old Speckled Hen Low Alcohol is available in Tesco at £1.30 a bottle.